Sandusky Lee's Ventilated Metal Front Storage Cabinet allows air to circulate to contents and helps you keep an eye on what is inside. 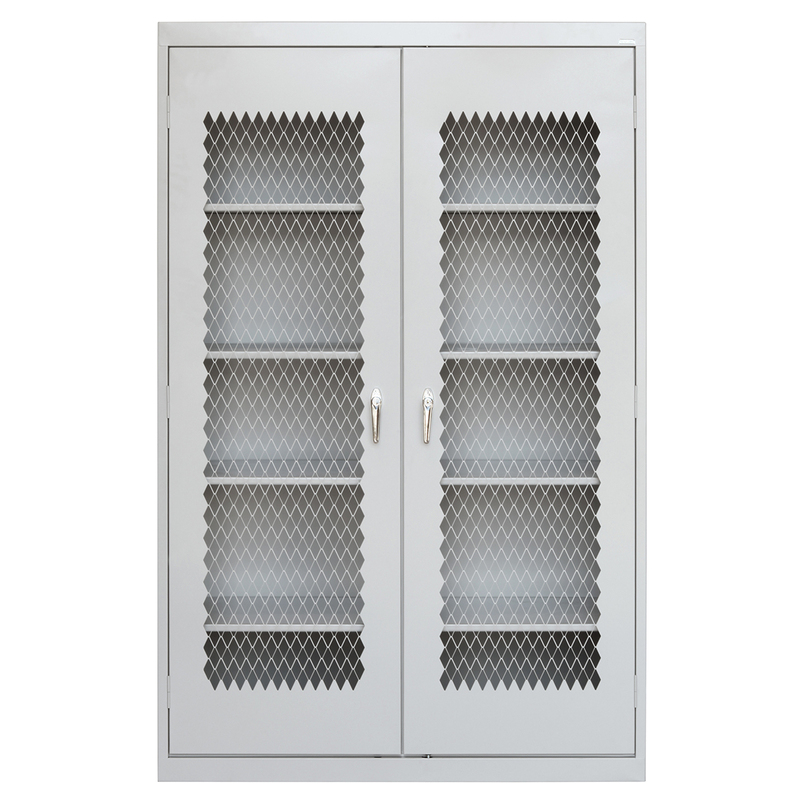 Each door features a locking handle and a 14-gauge expanded metal wire panel. Adjust the four shelves in 2" increments to fit equipment and supplies of a variety of sizes. The adjustable shelves, plus the raised bottom shelf, meet ANSI/BIFMA standards. This Sandusky Lee 36"W x 24" Ventilated Metal Front Storage Cabinet comes in several great powder-coat paint finishes and ships assembled. Sandusky Lee's Ventilated Metal Front Storage Cabinet allows air to circulate to contents and helps you keep an eye on what is inside. Each door features a locking handle and a 14-gauge expanded metal wire panel. Adjust the four shelves in 2" increments to fit equipment and supplies of a variety of sizes. The adjustable shelves, plus the raised bottom shelf, meet ANSI/BIFMA standards. This Sandusky Lee 46"W x 24" Ventilated Metal Front Storage Cabinet comes in several great powder-coat paint finishes and ships assembled. Looking for a ventilated cabinet? Sandusky Lee's Ventilated Metal Front Storage Cabinet allows air to circulate to contents and helps you keep an eye on what is inside. Each door features a locking handle and a 14-gauge expanded metal wire panel. Adjust the four shelves in 2" increments to fit equipment and supplies of a variety of sizes. The adjustable shelves, plus the raised bottom shelf, meet ANSI/BIFMA standards. This Sandusky Lee Ventilated Metal Front Storage Cabinet comes in several great powder-coat paint finishes and ships assembled. Customer satisfaction is our top priority, so give our SCHOOLSin customer service team a call at (877) 839-3330 for help with a quote or order.